When Bacolodnons come home for the holidays, a steaming bowl of Kansi is one of the must haves while in town. Locals living in Bacolod City flock to Kansi Houses regularly, but it’s especially good to have during rainy weather. Here is a recipe of the local Kansi which is something like a cross between sinigang and bulalo soup. – Add the rest of the garlic until slightly brown and saute with the tomatoes. – Add the beef shank and beef pata. 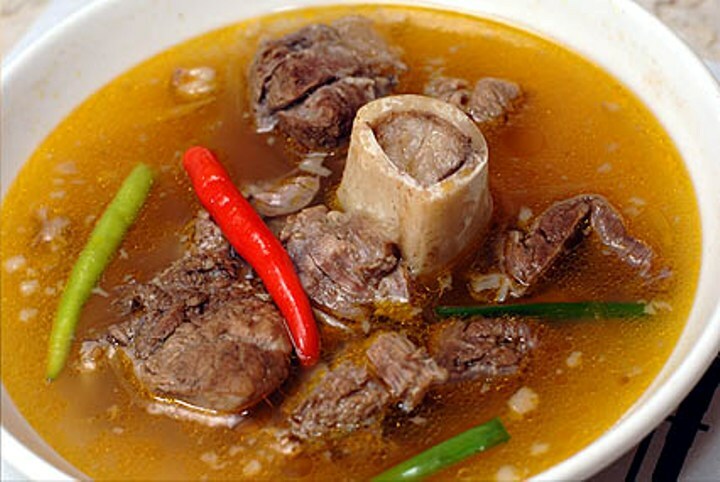 – After 30 minutes open your pressure cooker and check the beef shank if its tender as it will cook first before the pata. If it’s tender take it out and put aside. – Prepare the Annato seeds by adding some of the hot broth to the seeds let it sit for awhile till the colors come out. This entry was posted in Bacolod City Cuisine and tagged Bacolod CIty Cuisine. Bookmark the permalink.